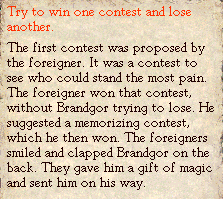 Issaries takes Brandgor through the short-cut that leads to the faraway place where he sold the truth. 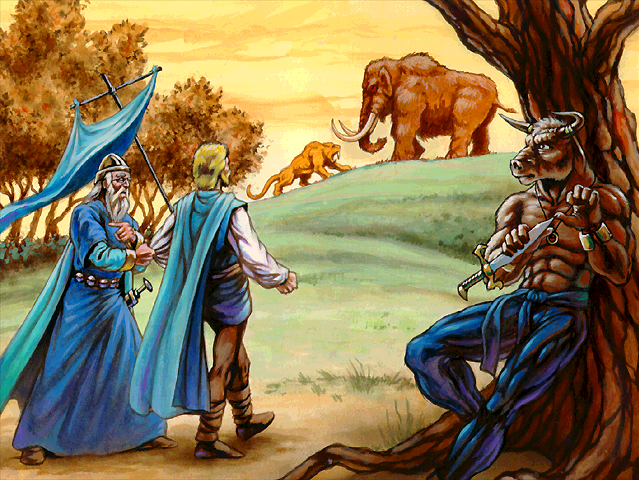 But he becomes distracted, showing more interest in an argument between mastodons and sabretooth tigers than in taking Brandgor to the god that bought the truth. -"The truth is more important than reconciliation!" -"The truth is more important than squabbling animals!" -"Without the truth, there can be no trade." -"Without the truth, there can be no travel." -"Without truth, there can be no reconciliation." The legends may be very slightly helpful here.